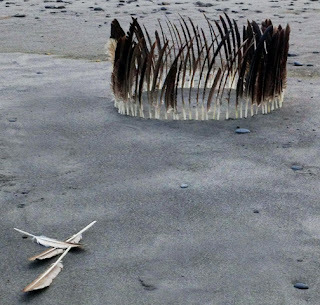 In just one mile on a remote Washington beach laid all these and more eagle feathers. They were sitting on the sand and mixed in the drift at the high tide mark. After being arranged in a circle, the tide redistributed them up and down the beach where they now lie. Curiously, almost all of these feathers were from the tips of the wings, the primaries. These birds more or less shed only two matching feathers at a time, one from each side. Most small birds start their molt in the middle of the wing and proceed outward over a few months until growth is complete. Larger birds like the eagle may take several years since it is harder for them to fly with even one feather shed from each wing. I wonder where all these feathers came from since I only saw about half a dozen eagles all day.